Professor Jonathan Parker & Dr Sara Ashencaen Crabtree are currently examining social work in Malaysia as part of their project ENABLE (Establishing Sustainable Research Networks and Building Learning Environments). As seasoned academics who have, between us, experienced numerous reviews of social work education, it was fascinating and exciting for us to learn about and discuss some of the proposed changes to qualifying social work education in Malaysia in anticipation of their forthcoming Social Work Act. We were fortunate to attend a meeting to discuss how current social welfare workers in government and non-governmental organisations might be assisted in developing knowledge and education to a qualified and pre-qualified level. 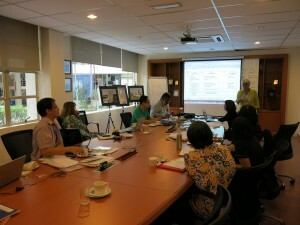 The meeting, attended by an independent Australian consultant, Malaysian academics, NGOs, representatives of MASW and the Methodist College of Kuala Lumpur, expressed the laudable concern to professionalise social work rightly focusing on increasing and regulating the educational qualifications needed to practise in Malaysia. Context is all-important when designing and developing any curriculum but more so in respect of social work programmes because of the interpersonal, social and cultural aspects of the work. However, isomorphic global trends in higher education in general and social work in particular make comparisons and sharing ideas useful, even when we acknowledge that social work as a discipline and practice differs from nation to nation across the world. We were able to offer some insights and reflections following recent UK experiences as a way of highlighting some of the pitfalls that might arise and could be best avoided. We followed this by exploring possible ways forward for academic social work including publication strategies and internationalising the curriculum and departmental outlooks for those universities offering social work. This will be continued in discussion later in March 2014. Developing a robust research base for the profession that speaks with authority and evidence. Research that is about, for and with social work and social workers. Learning from the mistakes of other countries, e.g. England’s recent official approach to professionalization, as well as from their successes, whilst ensuring that all developments are appropriately contextualised and address the needs of all peoples in Malaysia. Internationalising social work education to be able to assess the worth of other models, to understand other approaches and to enhance confidence in bespoke Malaysian approaches where they work well and to adapt them when they do not. A core element of learning that UK, and especially English, social work academics and practitioners need to undertake is to reflect on the core principles that are demonstrated elsewhere in the world; principles that are, in fact, illustrated by the commitment, energy and ‘can-do’ attitude we have seen from Malaysian social workers, NGOs, professional bodies and academics. In a recent note we sent to our UK Association of Professors of Social Work about our need to learn from global approaches to social work, we were heartened to hear how many of our colleagues agreed wholeheartedly. Malaysian social work possesses a number of important strengths that will assist in making the most of the challenges and opportunities that lie ahead. These include strong and competent academic teams within the universities who work with each other, government departments, NGOs and professional bodies and speak with a single voice, in the main, about the way forward. The enthusiasm and dedication of social workers, managers and academics promoting a ‘can-do’ attitude that will make positive change happen. It is important, however, to foster a critically reflexive approach that allows for challenge and resistance where that is appropriate. This may be harder to achieve for our colleagues for whom compliance is a virtue taught from an early age. Malaysian social workers should promote their achievements across the region and across the world. We saw many examples of good practice to highlight. Furthermore to sustain these excellent developments we discussed the importance that the universities, in conjunctions with other social work groups, develop and work towards a robust research strategy. Social work research is not costly, and much more important than addressing university KPIs for income-generation (which in social science, in general, is difficult and often more so for social work which across the world is seen either as a poor relation to other disciplines or a troublesome aspect of life). However, conducting social work research provides both understanding and illumination of social phenomena and an evidence-base for social work that can be used to grow its future. One of the most important elements of such a strategy that we discussed together concerned publication and we offered our experience suggesting that publication in international, as well as ASEAN, journals represents the best way forward. Whilst this can be difficult when writing in a second language our established experience with social work colleagues at both Universiti Sains Malaysia and Universiti Malaysia Sarawak shows that writing with scholars from other countries, and including native English speakers can overcome these difficulties. Doing so increases the visibility of Malaysian social work and citation counts, something that our colleagues we aware may appeal to their university managers. The future is potentially very bright for Malaysian social work, and we hope that the opportunities will be grasped and a qualified, skilled, principled and professional workforce represents the future. What does the Nigerian Election 2015 tell us about Africa’s largest democracy?